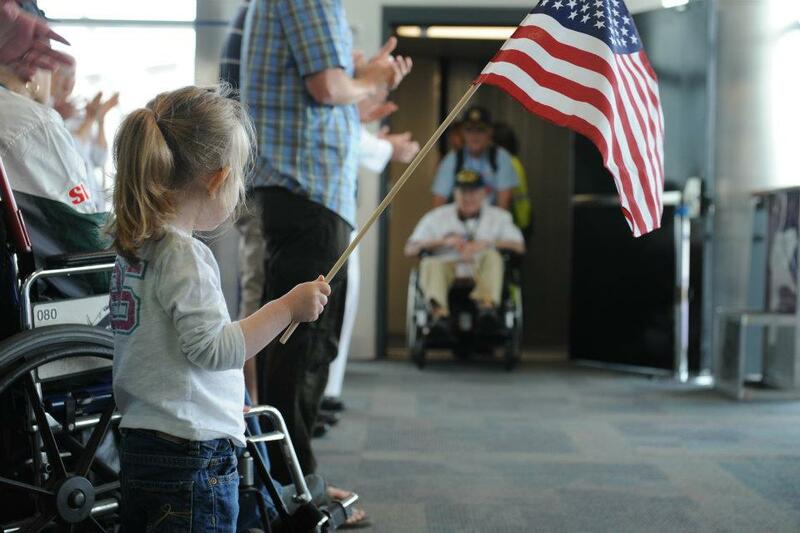 StoryUP : Virtual Honor Flights for WWII Veterans: Are you on Board? Virtual Honor Flights for WWII Veterans: Are you on Board? On September 4th, a group of about 60 World War II veterans will leave Columbia, MO headed on a plane to Washington, DC to see their WWII memorial. But Bud Garnett of Laddonia, MO will not be one of them. At 93, he's too sick to fly. However thanks to new technology, there's still a way Mr. Garnett and other aging veterans like him can see their memorial with a new endeavor called "Virtual Honor Flight." 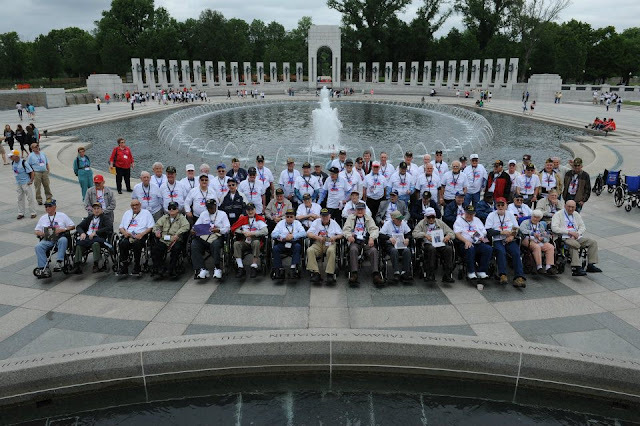 It's a special online tour for what Honor Flight calls its "TLCs." This is The Last Chance for these American heroes to see their memorial. The WWII memorial wasn't built until 2004 and sadly, most of its veterans won't live long enough to see it. That's why we need your help. Please keep reading. On September 4th, the same day Mr. Garnett's fellow veterans will fly to Washington, DC on an Honor Flight, a group of volunteers will bring a Virtual Honor Flight to his house. Veterans United Home Loans in partnership with Central Missouri Honor Flight will offer the first-ever "Virtual Honor Flight" via Google Plus Hangouts. Using this group video chat room and live streaming technology on You Tube, Mr. Garnett and other aging veterans will get to see their memorial and experience the magic of an Honor Flight from the comfort of their own homes, even if they're too sick to fly. But we need your help. We need to find these men and women. Not many World War II veterans are using social media to find this post. We are losing our World War II veterans at a rate of about 1200 a day nationwide and few know about this free opportunity to get a live tour of their memorial. If the veteran is able to fly, print an application and mail it their local honor flight hub. Don't wait. Help the vet fill out the application. If you live in Central Missouri, please visit www.centralmissourihonorflight.com to print off an application and mail it in. If the veteran is not able to fly and wants to see their memorial, let me know ASAP so we can get them on a future Virtual Honor Flight via Hangout. Email me the vet's name, city location,email and phone number to sarah.hill@veteransunited.com . Hangout seating is limited for the September 4th Virtual Flight. Mr. Garnett experienced the Invasion of Sicily, England, France, Berlin and Italy. He was part of D-Day, the Battle of the Bulge and the Invasion of Normandy. Thanks to John Butterill and Bruce Garber of Virtual Photo Walks for helping us secure volunteers to give veterans a live tour of the World War II Memorial in Washington, DC. In addition, this D-Day veteran will also get to see the beaches of Normandy in France and a look at a WWII memorial in Australia. Google Plus Hangouts provide these aging veterans a global tour of their memorials ....but only if we can locate these individuals. Don't wait. Tell a vet today about this opportunity to experience a Virtual Honor Flight. In 1941, Mr. Garrnett was drafted to the Army and told he would serve only one year and a day. However days after his draft, World War II broke out and the 22 year old would have to stay apart from his family for four years. Can you imagine not seeing your family for four years? Our veterans wrote out a blank check payable up to and including their lives to secure our freedom. Going to your local senior center, Veterans Hospital or Nursing Home and telling them about the (in person) Honor Flights or Virtual Honor Flights is a small price to pay for their sacrifice. Do you know a World War II veteran who wants to see their memorial but is not able to fly? Then let's get them on a Virtual Honor Flight via Google Plus Hangouts. Share this post. +1 and add Veterans United to your Circles. Then on September 4th, you can rotate into VU's Hangout to briefly share a word of thanks with these WWII veterans. You must be in our 'approved Hangout' circle to join this Hangout. Thank you for remembering. Not many do these days.And thanks to whomever took the photo. Speaking of which more photos would be great as there are a lot of us old veterans that will never get the chance to see all the memorials in DC. My father was there, he got wounded in Normandy France on July 5, 1945, by shrapnel from a German 88 artillery shell, that went through his arm and exited out near his elbow, this during a heavy counter attack by German forces. We hold on to his Purple Heart with great pride, and appreciate all that served in defeating Hitler. God Bless them !